DaMa Edna: Celebrating Troyer’s third Gotcha anniversary! Um, better late than never. I’m sharing some pictures from the past three years for you to see how special he is to us. Panky: He wuz cute in da beginning. Iz wuz happy to haf playmate but meNow, he thinks he da boss of me. Not. Troyer: Meowmmy! Are dese da only pictures of me you gonna show? Iz bery handsomer den brofur, aren’t Iz? DaMa Edna: I am fortunate to have two special panfurs in my life! Panky: Polydactyl panfurs are very special breed. puurrrlease say so in da comments section. Panky: Dere’s a saying that the eyes are the window to the soul. We think we are more expressive with one look than it takes a philosopher a lifetime to describe. Troyer: Me thinks Iz more handsomer den brofur. Leaves a comment below if you think so too. DaMa missed the exact date for mai blog-versary. How could she furget sucha impawtant date????? Secondly- Iz celebrating my fifth birfday! If ya put it in Human terms, I’m in da prime of my mancat-ness! Iz nose dat Iz would haf another life life if me neva met DaMa. In all honesty, Iz furtunate to have such a loving an caring Human. She is a furtastic staff for all mai and Troyer’s needs and wants. Dese pictures are only a small purrtion of my wonderfur life here. Iz bery much purrfurs having this one. “A cat’s New Year dream is mostly a bird! dream something that you have never dreamed! I wood like to share how me and brofur have enriched our lives by trying new things. As you may know, Cats purrfur routine, and don’t like changes without their consent. Troyer: Me likey routine. But Da Meowmmy sumtimes hafs weirdo werk times. Panky: Iz likey to be fed at certain times of da day too. But that’s not reason fur dis post. to help us not be so bored when she not home. Troyer: Wut is dis? New way to drink water? 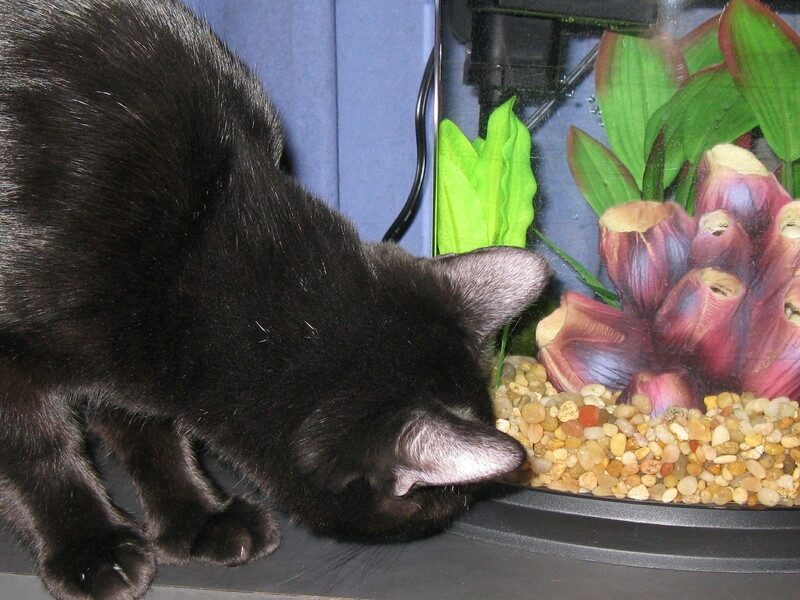 Panky: DaMa gots us FishTV! 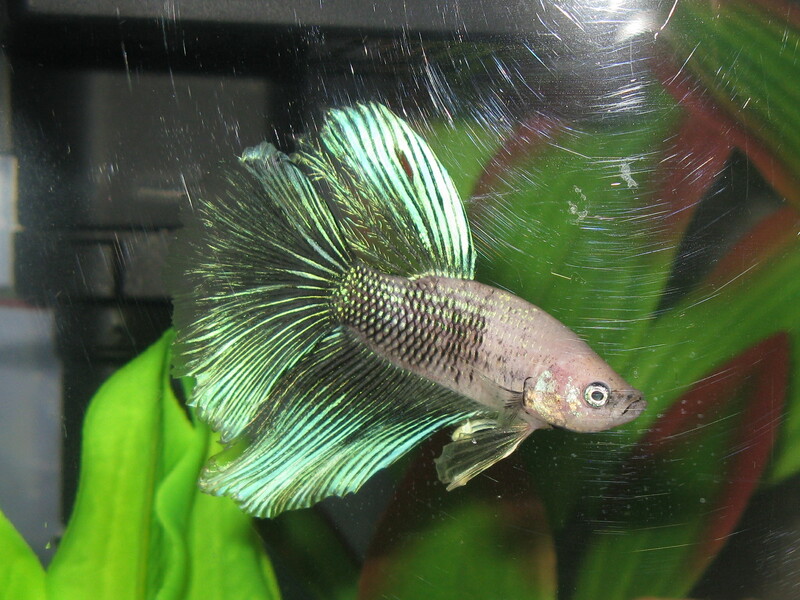 She say dis is a half moon betta. She names it Turk Quoise because of his beautiful shadings of blue. Panky: As you can see we fur-sinated by Turk for the first couple of days. But da novelty wore out and we no longer enjoy watching hims all da time. Troyer: Hey! Iz still likey to watch Turky Fishyboy but not as much as before. Iz fink we need more fishys. 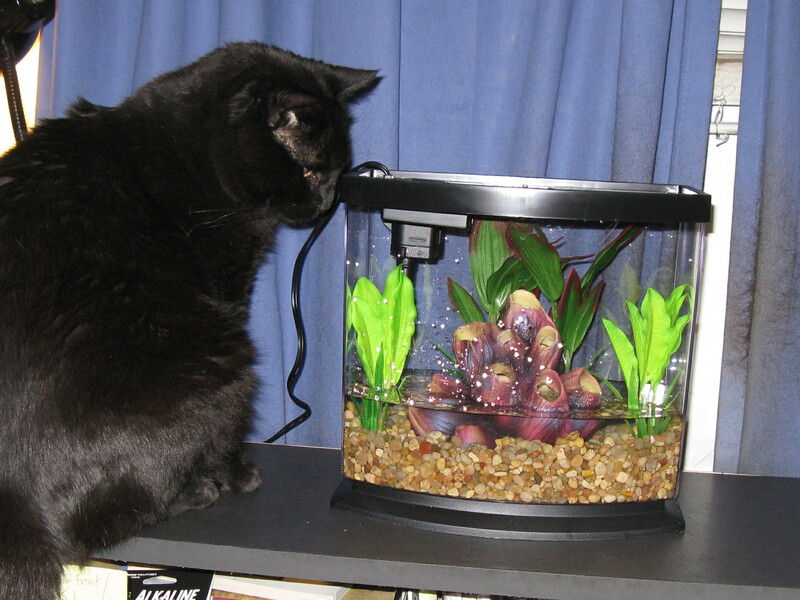 Panky: DaMa say Turk’s home is an Aqueon LED BettaBow 2.5 Desktop kit aquarium. along wif da coral to make it more interesting for Turk. Troyer: We wanna know what fun and interesting fing are you dreaming of fur da mew year? Polydactyl Panfur Purrs and Happy Mew Year! A cat is a tiger that is fed by hand. 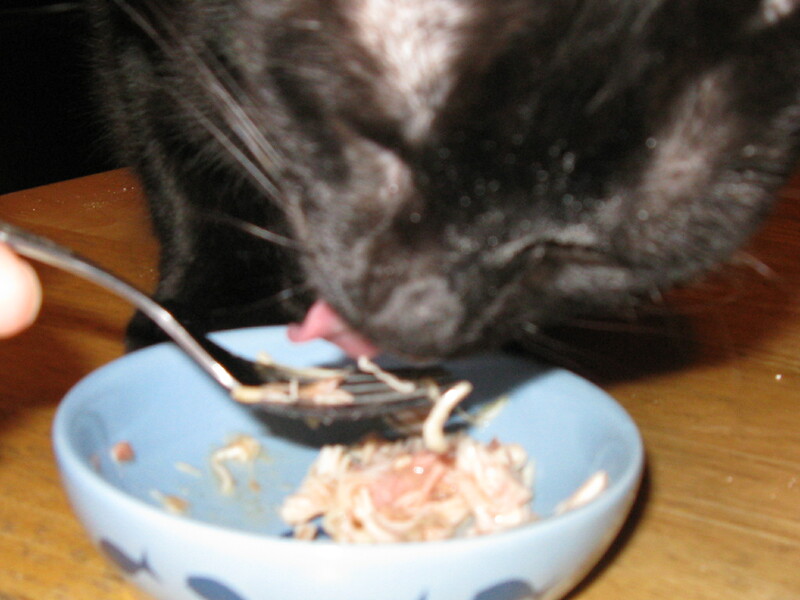 Panky: While we are panfurs and not tigers, we lubs our noms! Panky: *rolls eyes* He’s always hungry! Troyer: Meowmy sez Iz more active den you an burn off all da fuds Iz eats. Dese are frums da Itsie Bitsie Rescue, located in Citrus Heights, CA, who takes care of many babies like dese wee ones an gets dem ready fur der mew fur-ever families. Troyer: Dose babies are really small. My polydactyl paw bigger den their head. Panky: MOL Dat may be true but they’ll grow big n healthy wif all da care dese Itsie Bitsie gives them. I fink dey will grows up to be tigers because of all da luvs and attention dey get. Panky: Are you a tiger whose fed by hand? Leave yur comment belows. Polydactyl Panfur Purrs for Wordless Wednesday! Panky: Thursday is National Cat Day. Around here, everyday is Cat Day. Even Troyer agrees wif me. Troyer: Iz can haf more noms today because of dis national cat day? Me wondering what makes today so special? Me and brofur totally agrees on adopting your mew fur buddy. and Troyer was adopted as mai minion, er, companion. Troyer: WaaaitAMinute! Me purrs bery loudly frum all the chin scritching Meowmmy gibs me. Ya finks dese humans consider dat unconditional loves? Itz more likey when Iz want love n attention- I demands it! Me wanna know how our kitteh readers celebrate National Cat Day? Panky: Me show belly for DaMa because she da only human Iz trust. Iz haf claw-veyed dat she is not to rub mai belly like she did wif the doggies dat lived here before me. A couple of bites helps her remembers too. Do you trust your Human to show your belly? We hadn’t published our bloggy in a while. DaMa new werk has taken up lots of her free time when she not attending to our demands. But dat’s okay, as brofur Troyer an me halps her see that all she needs to do is be more like us- take more naps and purrs. Do you halps your human? “A window—it’s more entertaining than TV. We jus hangin out looking out da window.